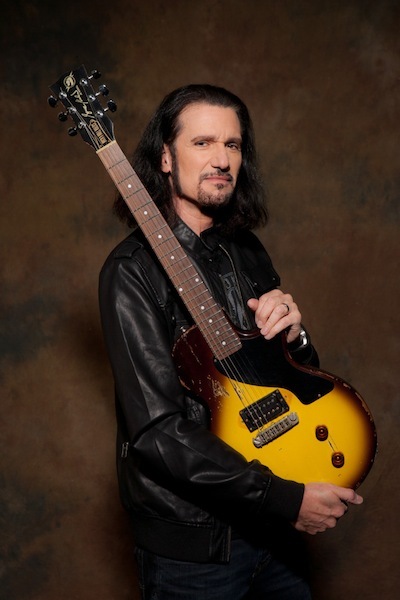 Alex Obert of Journey of Frontman spoke with former KISS guitarist Bruce Kulick. Highlights from the interview appear below. Bruce Kulick: (laughs) That’s funny. I went to the Classic Rock Awards and that was really cool. I really love that magazine. They really do very, very cool in-depth articles on any band. So they finally did one here in California, all the other years were in England. That’s where you will see Ozzy and Joe Perry. And they’ll give awards. Is it as big as the Rock and Roll Hall of Fame? No way. But, to me, it’s the best awards show that’s related to the genre that I’m known for with KISS. You’re not gonna see a rap artist there! (laughs). Alex Obert: Do you agree with the idea of KISS continuing as a brand after Gene and Paul are gone? Bruce Kulick: We’re not there yet. (laughs) I know that Eric made some comments saying he wouldn’t be into it. And I don’t think he would be into it. I think it would be kind of weird because you’d have twenty, thirty years in the band and then be playing with guys that are cover guys. Bands like Judas Priest having Ripper Owens pop in for a while, he did a good job. Or Journey with the Philippine kid that can sing like Steve Perry. I think that that model works. I mean, look, Gene and Paul didn’t wanna work with Ace, Peter was done, it’s possible to insert somebody else to do that. So I don’t even think what they’re doing now is wrong at all. And honestly, I think it would be completely different if Gene and Paul were actually ready to step down. They’re not ready to step down yet. But obviously KISS fans love the conjecture of “what if?” and “what do you think?” Everyone goes wild, the boards and everything. It’s very askew in many directions. And I know Doc had said some things about it, then Gene says, “It’s not true! Paul would come out and say something like that. Nothing like that is happening!” It’s silly to talk about [it] while they’re still very vital and hungry and relevant and out there. But I don’t think just because Gene or Paul would say that they’re retiring that Tommy and Eric would still hang around, even though they’re little younger. Tommy’s actually the youngest. I think it would be a whole different angle if something else would happen. That’s just my opinion. I have no facts behind it. I think what they created is iconic. I wasn’t part of that version of KISS, and yet, I’m a part of it. So there’s a whole [a]nother era that I represent. And I know there’s many fans that really love that too, it’s not as identifiable, but certainly unique. Many great albums and songs and tours, that’s what I concentrate on. But certainly, these guys could carry on the four iconic characters in many, many shapes. That’s why merchandising is unbelievable. And now they’re doing something with a Japanese artist, doing stuff like that. They were big with Hello Kitty. It’s really incredible what they created. Truly incredible. It’s timeless and it keeps attracting new generations. And then when they get really into it, the parent pops in and notices something like KISS Unplugged. Then they’re mesmerized by it. And it’s still KISS. With no crazy outfits. I can’t believe how many of these young kids that might meet me at an event or something and they’re just so enamored with me. I didn’t wear any makeup or anything, but I did get to perform that music. I got to be presented in the manner of lead guitarist with KISS. Read Bruce Kulick’s entire interview with Journey of Frontman here. I believe I fixed the link, try it again. Possibly the dumbest comment ever on this site, and there have been some dumb ones…..funny though. Great comment, nothing dumb about it. “Revenge” is a tremendous album. Bruce and Eric are far more talented musicians than Paul and Gene; you can tell they pushed them musically on this one.